Cool off this summer with a swim at the Student Activity & Academic Center on Emory's Clairmont Campus. Discounted memberships are available for faculty and staff, while the daily walk-up rate is just $10. Looking for things to do this summer? While campus events slow down between the spring and fall semesters, Emory still offers a range of opportunities focused on fun, fitness and expanding your horizons. Many of these options are free for Emory employees or involve only a nominal cost. Most welcome family and friends, while a few are geared specifically to employees. 1. Go swimming in the SAAC pool. 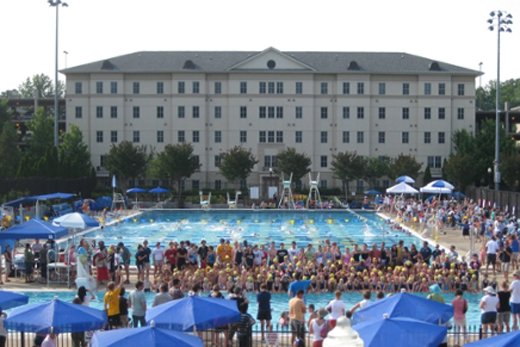 The aquatic center at the Student Activity & Academic Center on Clairmont Campus features an Olympic-sized pool, teaching pool, kiddie pool and diving well. SAAC offers discounted annual and summer memberships for faculty and staff, as well as 14-visit guest passes that average to less than $9 per visit. The daily walk-up rate is $10. 2. Take a fitness class. Blomeyer Health Fitness Center offers a free class for Emory faculty and staff each month. For June, it’s Track Class, featuring walking or jogging for all fitness levels on the indoor track. Register by June 8 for the June 9 class, set for 12:15 to 1:15 p.m. at Blomeyer. Plan to arrive 5-10 minutes early with your ID and waiver. Conceived by Carlton Mackey, director of Emory's Ethics and the Arts Program, the “Typical American Families” exhibit offers a photographic glimpse into the lives of 15 diverse Atlanta-area families through images by international photographer Ross Oscar Knight, Mackey’s creative partner. The free exhibit runs through July 17 at the Center for Ethics; drop by from 8:30 a.m. to 5 p.m. Monday through Thursday or 8:30 a.m. to 4 p.m. on Fridays. 4. Walk or run in Lullwater Preserve. Lullwater Preserve, which includes the home of the Emory University president, offers a variety of paved and unpaved trails, woods, lawns, Candler Lake, a suspension bridge and much more. Curious about how far you’re walking or running? Emory’s Faculty Staff Assistance Program offers a map with the lengths of several routes. Lullwater is open during daylight hours. 5. View the “African Cosmos: Stellar Arts” exhibit at the Michael C. Carlos Museum. “African Cosmos,” a Smithsonian exhibit from the National Museum of African Art, is the first major exhibition exploring the historical legacy of African cultural astronomy and its intersection with traditional and contemporary African arts. It opened at Emory in January and closes June 21. The Carlos Museum offers free admission for Emory faculty, staff and students. Bringing family or friends? Regular admission is $8 for adults and $6 for other students, seniors and children ages 6-17; children 5 and under are free. 6. Catch up on your reading. Faculty members use Emory libraries frequently, but don’t forget that other employees and their children, spouses and domestic partners also have borrowing privileges at all Emory libraries. Checking out library materials is free — as long as you return books on time. 7. Learn about Southern food (while eating it, too). “From Corn to the Colonel: The Development of Southern Foodways” features food for thought from David A. Davis 95OX 97C on Monday, June 22, from 11:30 a.m. to 1 p.m. Hosted by the Emory Emeritus College as part of the lunch colloquium series, the event examines the origin and evolution of our region’s cuisine. Register in advance. Lunch (Southern food, naturally) is $10. 8. Visit the Emory Farmers Market. Held weekly during the academic year, the Emory Farmers Market goes monthly in the summer. Come out June 23 to purchase fresh local produce, sustainably produced meat, bread, cheese and other artisan products. Weather permitting, the market will be open from 11 a.m. until 3 p.m. in front of Cox Hall. Spend as much as you like, but there are plenty of options for $10 or less. 9. Enjoy a tuba and euphonium concert. Emory hosts the International Euphonium Tuba Festival June 21-27, bringing 200 guest artists, high school and college-aged players, and teachers from around the world to campus for a week of instruction, recitals and performances. The conference includes two concerts at Emory’s Schwartz Center for the Performing Arts that are free and open to the public. The Cobb Wind Ensemble performs at 7:30 p.m. June 26. The concluding Gala Concert takes place at 7:30 p.m. June 27, featuring nearly 100 performers from around the world. 10. See an Atlanta Braves home game. Of course, this last option isn’t actually on campus, but working at Emory allows you to purchase tickets for up to 40 percent below gate price. For “value games” on June 8 and June 11, that means you’ll pay only $10 for upper box tickets; other seating sections and selected games in June and July are also eligible for reduced prices. Tickets are available through Emory’s partnership with Sparkfly, which gives employees access to discounts on event and movie tickets, travel, restaurants and a variety of retail items. Sign in with your Emory network ID and password to see the full range of options.